I accepted this book for review expecting it to be a corporate thriller(I don't know what made me think so, may be it was it's cover page! )but what I got was something entirely different.This debut work by banker-turned-author Bhalindra Singh, is essentially the story of a U.S. settled upper-middle class couple,Zubien and Mekha Arora.They have decided to shift back to India and soon after,they chance upon a mysterious man named Adeeb.The chain of events which ensues and how it afffects the life of the young couple is what 'A Three Faced Coin' is all about.The story which starts off as a cliched,predictable horror story soon shifts gears(for it's own good! )and metamorphoses itself into a crime-thriller(yielding mixed results!). 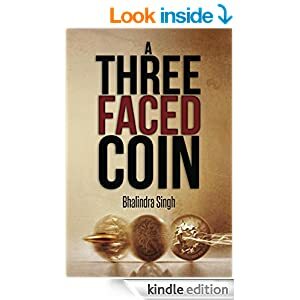 As I have mentioned in the beginning of this post,'A Three Faced Coin' is Singh's first work as an author.It's pretty evident that the author has got a rather innovative premise and an interesting concept to convey but the way it's told leaves a lot to be desired which is the biggest issue I have with this book.Anyways,let's look at the good things about this book first. First and foremost,the basic thread of this novel is quite appealing.Full marks to Singh for that.Though the language used is pretty functional,I liked his writing style-it's simple,yet effective.There aren't many lengthy descriptions and tiring blocks of prose which might weigh down the average reader.As a result, this work easily qualifies as an easy,light read.Having said that,I should also point out that that the book tries too hard to sound philosophical at times and ends up being preachy towards the middle portions (the conversation between Adeb and Mekha,for instance).These 'intellectual' pretensions stick out like a sore thumb,not gelling with the overall mood of the narrative. Singh has divided his first work into three parts and this is exactly where he has faltered.There is absolutely no connection between the first and the 'second' part(which narrates the story of the cunning Charlie)and the reader almost gets the feeling that he has suddenly started reading an altogether different tale.The 'flash-back' portions of Charlie are not only poorly written with lengthy,bland (gambling/betting) sequences coming one after the other but also kills the curiosity of the reader and only results in testing his patience.I hope the author edits out these un-inspiring sequences in the subsequent editions of the book and thereby make his debut novel more racy and entertaining.The way Charlie executes his ponsy schemes are entirely unconvincing(even silly at times).C'mmon,in this age of digitalization where there is easy access to information,why would someone risk all his life savings in a half-baked,ill-conceived scheme as proposed by Charlie? It's in the third part that the tale regains it's pace again(to a certain extend) where the missing dots are connected before it culminates in a rather ordinary climax.But by this time,I'm sure that half the readers would have lost their interest in the proceedings.The characters are also poorly developed with the reader not getting a chance to know the 'real' Charlie at any point of time.The 'Villains' are pretty weak and it's not very clear why 'Rambo' chose 'Charlie' for his illegitimate activities. The book has got a decent lay out and cover design (hats off to notion press for their quality work! ).The formatting is also good. If you are ready to overlook the occasional grammatical errors,the few illogical sequences,half-hearted 'comic' lines and the bland writing in the second part,you might find this as an okay,one time read.It definitely has it's own share of flaws,but is not a bad work by any stretch of imagination.Lend it from your nearest library.You won't regret it!